The locals here in South Lake Tahoe will tell visitors their unique stories of what originally brought them to visit Tahoe, but there’s a common bond that keeps people here. There’s something about Lake Tahoe that draws visitors in and makes them want to stay. With the mountains as your back drop, the lake sand beneath your feet and the crisp alpine air in your lungs, visitors feel the Tahoe magic. From beach side concerts to our downtown entertainment and wonderful restaurants, this place has it all. Not to mention all of our favorite South Lake beaches and marinas, and let's not forget the friendly people, why would any visitor want to leave? Check out some things to do in South Lake Tahoe (as well as other Lake Tahoe activities) below. There is no doubt that visitors and locals alike know how to have fun in South Lake Tahoe! The most obvious place for this is at Stateline, in any one of the numerous casinos. South Lake Tahoe has more casinos than any other part of the lake, and the locals call it "downtown.” And the locals will tell you that the casinos are home to some of the best dining in South Lake Tahoe. Two of the premier restaurants are Friday’s Station and 19 Kitchen, located on the top floor of Harvey’s and Harrah’s. You can watch the sunset from high above the lake as you enjoy some of their delicious filet mignon or seafood catch. But make sure you make reservations, because these places are busy with both locals and visitors. After dinner you can head to Sammy Hagar’s Cabo Wabo Cantina. Cabo Wabo is located in Harvey’s and offers food, live music and dancing without the nightclub crowd. If you’re feeling in the mood for a late night, you can continue the party at Montbleu Casino. Opal ultra-lounge is the place to be if you are looking to dance the night away to some of the best DJ’s in Tahoe. Want to get away from the casino crowds, but still want to have a good time? Then head on over to some of the more local spots, like Himmel Haus, which serves authentic German food and beer. Located at the base of Heavenly, it’s the perfect spot to hang out after a day skiing on the mountain. They always have an event going on! Rojo’s Tavern is the place to be after a Live at Lakeview concert. It’s within walking distance from the beach, they have karaoke and a full bar. Macduff’s Pub is a local favorite, serving unique Irish/American dishes and beer. They have a large outdoor patio for those warm summer nights! Another favorite place to watch the sunset while sipping on tasty drinks is The Beacon. This bar and grill is family friendly and is home to the infamous, “Rum Runner” cocktail. It’s located at Camp Richardson Beach and has a huge deck overlooking the lake. Everyone can enjoy free outdoor concerts on Thursdays during the summer, with plenty of fresh air and music. Lake Tahoe is known for its majestic natural scenery. What better way to enjoy it than attending a concert outside on the sandy beaches of South Lake Tahoe? A favorite for locals is the concert series at El Dorado Beach. The shows are called “Live at Lakeview” and they take place every Thursday evening during the summer. You can watch the sunset while enjoying some great, live music. They even have a beer garden to quench your thirst after a day out on the lake. The shows are family friendly and always a blast. Also during the summer, there are big name bands that play at Harvey’s Outdoor Arena. Check out www.TahoeOnStage.com for the latest line up. Many locals agree that South Shore at Lake Tahoe has the best skiing around. You will find everything from snowboarding to cross country skiing. For Alpine skiers, the most popular place to ski or snowboard is Heavenly Mountain Resort in South Lake Tahoe. Heavenly Mountain is a huge ski resort that has a California and Nevada side so you can ski in two states with 360 degree views. You can stay in one of our South Lake Tahoe vacation rentals for convenient access to the Heavenly gondola. The Heavenly village is located at the base of the gondola and has great shopping, restaurants and even an ice rink. It’s perfect if you aren’t much of a skier, but want a nice place to spend your time while your family is on the mountain. Sierra-at-Tahoe is a favorite place to shred among locals because it’s a lot less crowded and only 20 minutes from the Lake. Kirkwood Mountain Resort is just 35 minutes from South Lake Tahoe and was ranked the #3 ski resort on the west coast. For Nordic cross country skiers, South Lake Tahoe has more trails than one would ever be able to ski. There is also the recently opened cross country trails at the Lake Tahoe Community College, which are groomed 2-3 times per week and offer a view all around the college and along Trout Creek. Kirkwood also has specially groomed trails, located on the meadow and surrounding areas. Pyramid Peak Properties has beautiful cabins and condos in Kirkwood and South Lake Tahoe and has a friendly staff to help you plan your ski trip! Hikers from all over choose the Fallen Leaf Lake area as their hiking destination, with many hikers traveling through in the summer on their way along the Pacific Crest Trail. The reason why Fallen Leaf is exceptional for hiking is because there are many different grades to choose from and the temperatures are moderate. There are shorter family-friendly hikes that even Grandma can enjoy! There are also expert-level hikes that can take anywhere from one full day to several days. Not only are there lots of different options, but the hikes themselves are an escape from the city like no other. There isn't a hike in the South Lake area that doesn't have a view. And hundreds of fresh alpine lakes will keep you cool during the summer. In addition to Fallen Leaf, many locals and visitors like hiking around Emerald Bay due to the terrific iconic views. The Fallen Leaf Lake area is a gateway into the Desolation Wilderness. Just the name inspires a sense of adventure. The Desolation Wilderness is a federally protected area of the Sierra that with a permit, can be the perfect way to experience the high sierra mountains. Two popular trailheads to reach the wilderness are Mount Tallac and Eagle Falls. Rock Climbing and South Lake Tahoe go together like cookies with milk. This is due to the mostly granite landscape, therefore, rock climbing is very popular when it comes to Lake Tahoe activities. There are majestic rock faces that shoot up from the ground hundreds of feet high. There are also massive granite boulders that make for perfect bouldering problems. Whether you are just beginning or are at an expert level, there is climbing for everyone. Some popular spots are Lover’s Leap and Phantom Spires. Every person you meet in Tahoe whether a resident or visitor will have a favorite beach and they all offer something a little different. It’s amazing that the same lake can offer such varied experiences, topography and views at its beaches. Pope Beach is a favorite among visitors for its location to Camp Richardson, trees, and long stretch of sandy beach. Further down is Baldwin Beach, which is a favorite among locals for its wide open beach and proximity to Emerald Bay for kayakers and stand up paddlers. For lots of people, live music and festivities, visit El Dorado Beach, which is the first place you see the lake from Highway 50 when heading toward the casinos. Kiva and Reagan beach are two of the main dog-friendly beaches in South Lake. Kiva is on-leash only and Reagan is off-leash and is located right next to El Dorado beach. If you are feeling up for a little drive, Sand Harbor is a huge beach and walking area located about 30 minutes past the casinos. It’s known for its crystal clear, emerald green waters. There are several marinas throughout South Lake that offer boat, paddle board, jet-ski and kayak rentals. Two favorites are Camp Richardson Marina and Ski Run Marina. If you are searching for things to do in South Lake Tahoe, this is a particularly good choice, especially when the weather is always gorgeous here. Just as the beaches offer different experiences, so do the campgrounds. Camp Richardson Campground becomes its own little close knit community in the summer months. Visitors gather at Beacon Bar & Grill located right on the lake and the ice cream shop across the street. 'Camp Rich', as locals call it, has great access to miles of wooded biking and walking trails. DL Bliss State Park is located just north of Emerald Bay, making it the perfect place to kayak or paddle board to Emerald Bay. The emerald and blue color of the water will make you think you are vacationing in the tropics, that is until you get in the water and feel its refreshing chill. Bayview and Eagle Point campgrounds at Emerald Bay are close to trailheads and are only 20 minutes from town. Nevada Beach and Campground is located just past the casinos at Stateline. It has the widest span of beach with views of the entire lake. R.V. 's are also welcome in Tahoe. Stay at the Tahoe Valley Campground, if you have one. Pyramid Peak has a large selection of vacation rentals including homes on the lake to accommodate your whole family, as well as two bedroom lakefront condos. All with spectacular views and beach access. We also have rental homes located in town where you can live like a local! Wherever you stay, we are here to help you get the most out of South Lake Tahoe. What sets us apart from other vacation property managers is our boutique, family-style business. There will always be someone to answer your phone call 24 hours a day during your stay and even stop by the home, if needed. Whether you'd like dinner recommendations or have a question about boat rentals, we are here. 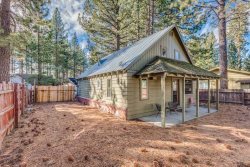 Our keyless entry system to our South Lake Tahoe vacation rentals means no long wait times at an office to pick up keys, you can go right to your rental and start your Tahoe vacation.